These cards are part of the set of cards used in Ton Onosaka’s packet effect “A Bicycle Built for Five”, (which is, itself, and authorized version of Phil Goldstein’s “5 Card Polka”). But the manufacturer mis-printed some of the cards, and so the cards can’t be used to perform Onosaka’s effect. However, I tossed away the misprinted cards, and realized that the remaining cards could be used to do a more sophisticated version of Nick Trost’s “Road Runner Card Trick”. The handling is similar, and by using the Onosaka design cards (instead of the cartoon Road Runner and Coyote cards), the effect can play for a more discerning audience. So that’s where the title comes from: part Roadrunner, part Bicycle Built for Five. The effect is this: magi shows five facedown cards, and tells the spectator that he has trained the top card to do an amazing trick. He turns the top card faceup, showing it to be a Joker. He turns it facedown and puts it to the bottom of the packet. A snap of the fingers and he turns the top card faceup, again showing the Joker. This is repeated twice more, and at this point the spectators have figured out that all the cards are Jokers, but the intrepid magi continues. He shows the top card (a Joker) and sets it aside facedown on the table. Magically (? ), the top card is again shown to be the Joker. If the audience has not demanded to see all the cards by now, the magician shows them anyway -- yes, all four cards in his hands are seen to be Jokers, as expected. But in an instant, the four cards change -- now they are only the BIKES that the jokers were riding. The card on the table is turned over to show all five jokers drinking beers after work! 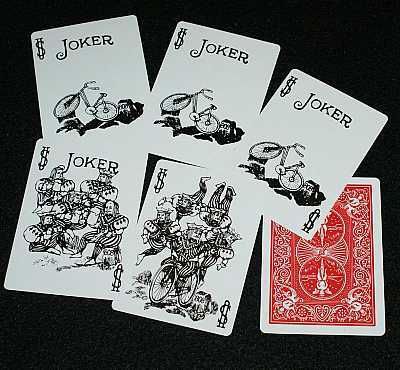 :-) (Or you can have a non-alcoholic climax, because an alternate card is provided, showing the five jokers acrobatically riding a single bike. Although all the cards cannot be examined at the end, there are no double facers or extra cards, so the handling and displays are very clean. Simple sleights involved, like multiple lifts, Hammon and Elmsley Counts. The cards are nice quality, and they handle well for all necessary sleights. But note: they are not printed by US Playing Cards, so they have a slightly different feel. Just to be clear, you CANNOT perform Onosaka's original routine with these cards -- and in fact, you cannot perform this Off-Road Bikes routine using a standard set of Onosaka's cards. This packet set has an extra card you do not get in Onosaka's original, and does NOT have a few other cards from the original. But with this set, you will be able to perform the routine above (using instructions provided, of course). © The Magic Gadget Site. All rights reserved.